Masterfully evoking the breathtaking beauty of India, Manisha Jolie Amin’s lyrical debut novel follows a young boy whose life takes an unexpected turn when he is sent to live with a reclusive but renowned musician. Abandoned as a young child, Kalu, a cheeky street-kid, has against all odds carved out a life for himself in rural India. In the quiet village of Hastinapore, Kalu has also found friends: Bal, the solitary boy who tends to the local buffalos, and Malti, a gentle servant girl, who, with her mistress, Ganga Ba, has watched out for Kalu from the first day he wandered into the small town. One day, perched high in the branches of a banyan tree, Kalu chooses a leaf, rolls it tightly and, as he’s done for as long as he can remember, blows through it. His pure, simple notes dance through the air and attract a traveling healer whose interest will change Kalu’s life forever, setting him on a path he would never have dreamt possible, testing his belief in himself and his sense of identity. 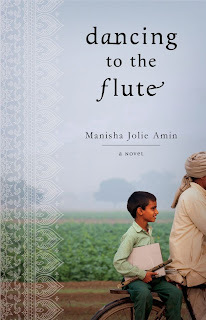 Richly textured and atmospheric, Dancing to the Flute is a magical, heart-warming story of a community’s joys and sorrows, the transformative powers of music, the many faces of friendship, and a boy’s journey, against all odds, to become a man. This is a beautiful tale with a fantastic setting. I'm drawn to stories told in India. Perhaps because it's like nothing I've ever known and I'm quite fascinated by other cultures. I connected with the characters and rooted for each of them throughout the whole book. I wanted all of them to escape their hardships, I wanted all of them to overcome the many obstacles in their way. And the music, oh the music! The way the author describes the lovely flute music made it come alive for me, I could almost hear it. I wholeheartedly recommend Dancing to the Flute and I'm looking forward to hearing more from Miss Jolie Amin. This book sounds really good, so I will add it to my TBR list (which keeps growing so much longer!!!). I really enjoy books about India, too. Have you read "A Fine Balance"? It is one of the 1001 Books You Must Read Before You Die, one of Oprah's book club books (I think! ), and a fabulous book overall. The ending lacked for me, but I thought the book was so good that it was worth a not so fab ending. I'm glad it made the cut because it's a book I recommend to everyone, even though the ending wasn't my fav. I thought it was really great! Sounds like the kind of heartwarming story I like to read. Nice review. Thank you Harvee :) It was definitely a good read! This one sounds absolutely beautiful! I also love reading about other cultures. I'll have to see if my library has a copy (or will be getting one). It really is. I can't wait to see what she writes next! Well I love the sound of the story, but the music coming alive through words? That's quite a feat, must be an amazing read! liking the sound of this, thanks for the recommendation. I'm always excited to see books about the impact music can have on our lives! I especially love the way you describe the music coming alive through the author's words. I will have to read this one. I like books that take place in other cultures as well - and India is one of my favorites to read about. This book sounds wonderful! India, China too. I'm so interested in the goings on over there, lol, not sure why. I always enjoy books set in India; if you haven't read The Girl in the Garden, definitely check that one out. I was pleasantly surprised by that and it had a wonderful sense of place. Loved it. I'll have to check this one out, too. Yes! Another fantastic book about India :) (As for The Girl in the Garden, I listened to the audiobook, not the best novel about India that I've ever read. It was ok-ish) Adding to my tbr!